Each year the Federal Trade Commission and and the Department of Justice Antitrust Division publish the Hart-Scott-Rodino Annual Report, which offers an overview of merger and acquisition activity and antitrust enforcement during the previous year. The Hart-Scott-Rodino legislation requires that all mergers and acquisitions above a certain size–now set at $80.8 million–be reported to the antitrust authorities before they occur. The report thus offers an overview of recent merger and antitrust activity in the United States. For example, here’s a figure showing the total number of mergers and acquisitions reported. 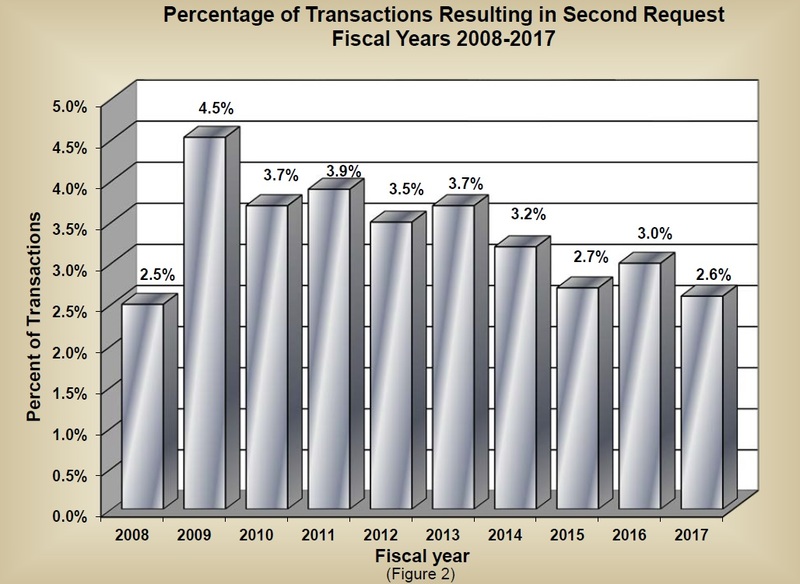 The total has been generally rising since the end of the Great Recession in 2009, but there was a substantial from 1832 transactions in 2016 to 2052 transactions in 2017.Just before the Great Recession, the number of merger transactions peaked at 2,201, so the current level is high but not unprecedented. 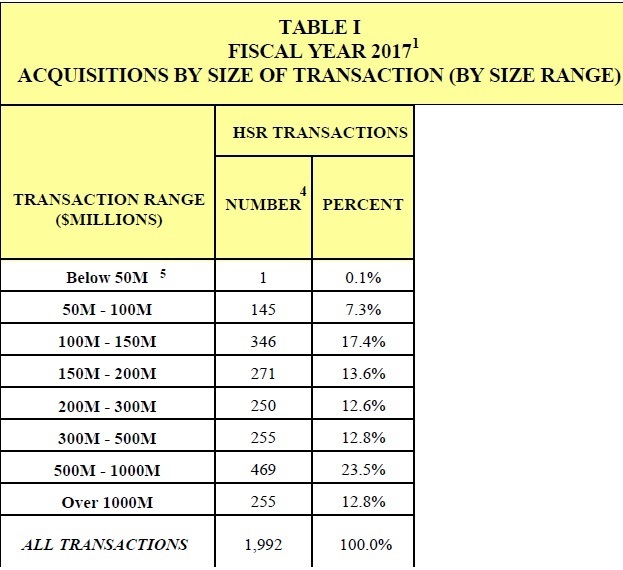 The report also provides a breakdown on the size of mergers. Here’s what it looked like in 2017. As the figure shows, there were 255 mergers and acquisitions of more than $1 billion. This percentage may seem low, but it’s not clear what level is appropriate.. After all, the US government isn’t second-guessing whether mergers and acquisitions make sense from a business point of view. It’s only asking whether the merger might reduce competition in a substantial way. If two companies that aren’t directly competing with other combine, or if two companies combine in a market with a number of other competitors, the merger/acquisition may turn out well or poorly from a business point of view, but it is less likely to raise competition issues.